Trans teenager Charlie Baum never imagined it would be possible for her to be crowned homecoming queen at her Georgia school. 17-year-old Baum told PinkNews it was “so validating” to win the title at Forsyth Central High School in Forsyth County—just north of Atlanta—on Saturday (January 26). The teenager, who said she has experienced “death threats and plenty of public humiliation” at the school, had her whole perspective turned upside down after her friends nominated her for queen. When the announcement was made, Baum said her family exploded with happiness and “so much screaming. They were in the bleachers and they just ran down and all started hugging me—and then there was even more screaming. Baum recalled “mostly just being sad” throughout middle school and was “scared of ridicule, scared of harassment and scared of myself” until high school, when she started wearing makeup and dressing in drag. She said she was finally “able to find the confidence to be openly loud and proudly gay,” but this prompted backlash from some intolerant students. As well as receiving death threats, the teenager was also bullied in front of other students. Nonetheless, Baum has remained true to herself, even starting an Instagram account in June last year to showcase her drag skills and pro-LGBT+ views. After accruing thousands of followers, she came out as trans in a post in December. Her friends, who already knew she was trans, were eager to support her. “My friends Midori and Nicole kind of told me they were nominating me and they started telling people to vote for me to be nominated for court,” Charlie said. 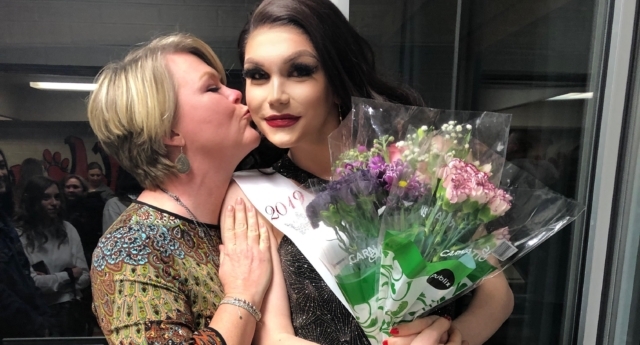 Baum’s family was initially worried that she had been nominated for homecoming queen as a joke—”like some real Carrie White stuff,” she said referencing the horror novel and movie Carrie—but either way, she was determined to compete. “Even if it had been a prank, I still get to stand there in a pretty dress? I win just by being there!” she explained. The trans teenager said she wanted her homecoming queen victory to convince other trans people to dream big.